ST. PAUL, Minnesota, March 13, 2012 (ENS) – All of Minnesota’s electricity generation needs can be met by wind and solar sources combined with improvements to the state’s electric grid system and energy efficiency policies, according to a report released today at a news conference in St. Paul. “Minnesota’s renewable energy resources are large enough to accommodate any foreseeable growth in electricity demand in the next four decades and beyond,” the report states. 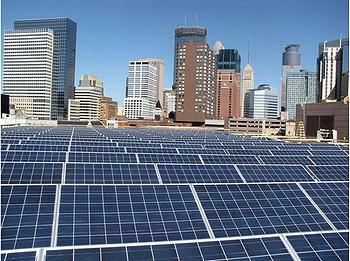 “Renewable Minnesota: A technical and economic analysis of a 100 percent renewable-energy based electricity system for Minnesota” was researched and written by engineer Dr. Arjun Makhijani and Christina Mills, attorney and staff scientist at the Institute for Energy and Environmental Research in Takoma Park, Maryland as well as Dr. M.V. Ramana of Princeton University. Minnesota’s electricity sector currently accounts for over one third of the state’s greenhouse gas emissions. State policy is to reduce emissions by 80 percent by 2050. The report shows that Minnesota has more than enough wind and solar resources to meet the state’s demand for electricity generation and that a renewable electricity sector is technically feasible using proven technologies. The report assumes that the composition of renewable energy generation is a mix of commercial-scale wind energy and rooftop solar photovoltaic panels, due to economies of scale and the most likely application of each technology in Minnesota. The storage technology that the authors assume for their analysis is compressed air energy storage, which has been used commercially for decades with coal-fired power plants in Germany and Alabama. Compressed natural gas storage in caverns and aquifers is also a standard technology. “In our analysis we maintain the usual reliability criterion – 12 percent reserve margin over demand – for every hour of the year,” write Makhijani, Mills and Ramana. The report calculates that a renewable energy electricity system would cost about the same overall as at present if efficiency improvements are made along with the transition to renewable electricity generation. The report recommends conducting a statewide energy efficiency study, including both technical and economic aspects. The authors say the state should require utilities to include increased renewable energy and storage in their Integrated Resource Plans and develop and implement a timeline for achieving a 100 percent renewable energy standard.